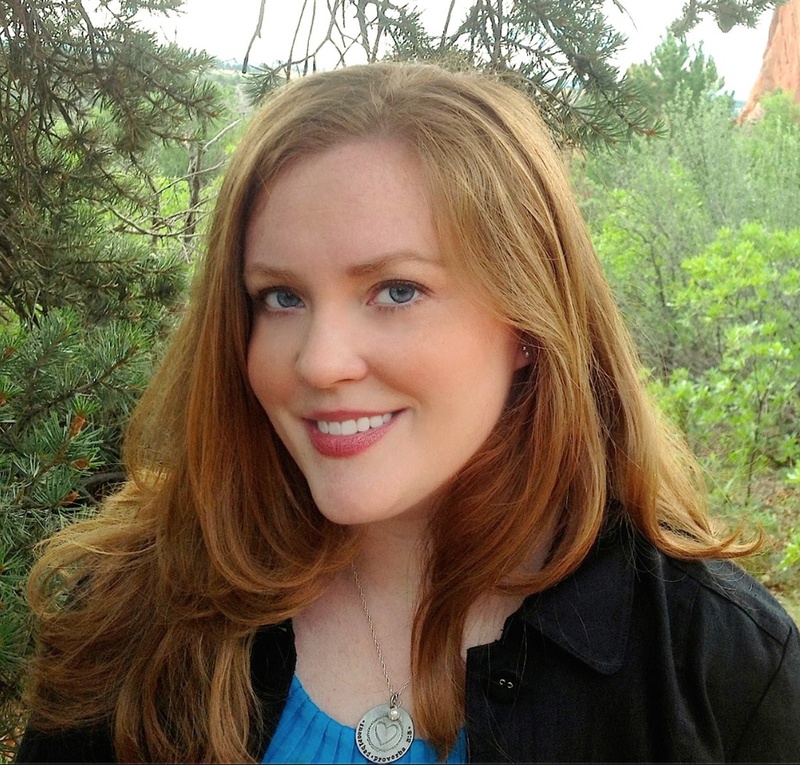 Amanda Hope Haley has a Master of Theological Studies degree in Hebrew Scripture and Interpretation from Harvard University and a Bachelor of Arts degree in Religious Studies from Rhodes College. She contributed to The Voice Bible Translation as a writer and editor. Amanda’s first book, Barren among the Fruitful: Navigating Infertility with Hope, Wisdom, and Patience, is a part of the InScribed Collection. She and her husband, David, presently reside in Colorado but will soon be moving to Tennessee. What started you on your writing journey? David and I were in and out of fertility clinics for seven years. During most of that time we kept our pain a secret, but as we started to tell others about our struggles, I became a lightning rod for women facing infertility themselves. In July 2012, two friends confessed to me the same tragedy within eight hours of each other; both had miscarriages the previous day and both were eight weeks pregnant at the time. I called David from the quiet of my home office where I was editing part of The Voice Bible translation. I was disturbed. Shaking. Crying. Confused. Overreacting! But my David was patient with me and asked me the strangest question, “If you were to write a book about all this, what would you say?” I spent the next thirty to forty-five minutes writing. I left my office exhausted and crashed on the couch for a four-hour nap. I was awakened from a very deep sleep by a publisher at Thomas Nelson calling to ask me about a ghostwriting project. During our “small talk,” I told him what had happened to our mutual friends and how upset I was that morning. He asked, “Would you be interested in writing a book about infertility?” Only then did I tell him about my crazy forty-five minutes and the outline sitting on my desk at that moment. His exact words are burned in my memory, “Polish it up, and send it to me by Friday.” I think I sent it to him by the next hour! That conversation led to me becoming part of the InScribed authors’ community. Just as all good novels include a plot twist, our Author and Creator often writes a twist or two into our lives—some that ultimately bless us more than our original plan. Have you ever experienced such a “Divine Detour”? Way back in 2002, my best friend dreamed I was an archaeologist in Israel and a mother of four children. She told me about David arriving at my dig site fresh off a plane—gathering our daughter in his arms, kissing me, and corralling our three unruly redheaded boys. It was the life I wanted and almost expected to have. The many years David and I spent failing to deliver babies changed us not because we didn’t get what we wanted, but because we learned (the hard way!) to trust God’s plan for our lives. This was even when it is contrary to our own plans. Since we accepted that children are not in our future, David and I have moved across the country twice. David is always flying somewhere for work, and I tag along since all I need to do my work is a laptop. We are constantly meeting new people, and we are thankful that we can send our meager resources outside of our family as He leads us to do. None of that would be possible if we had little ones at home. 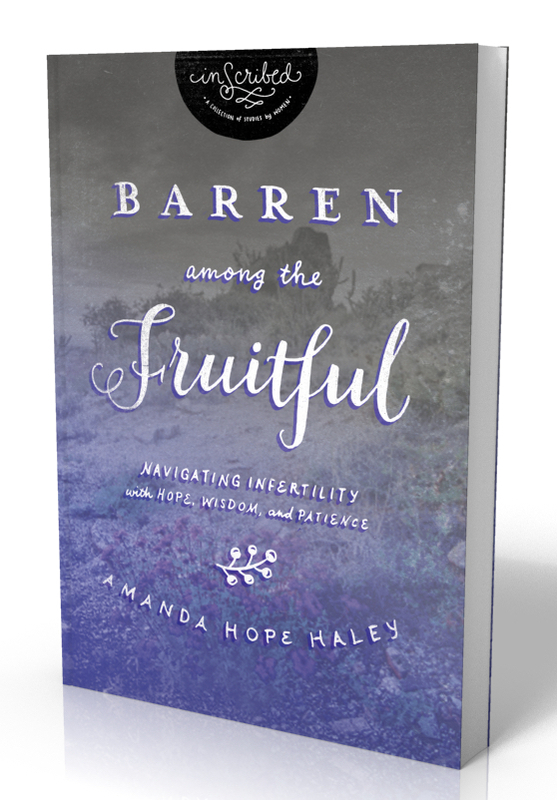 Let’s talk about Barren among the Fruitful: Navigating Infertility with Hope, Wisdom, and Patience (Thomas Nelson, October 2014). Please tell us about it. During my seven-year journey with infertility and miscarriage, I needed three things; information, companionship, and faith. None of these were fully addressed by the publishing world, whose few books on infertility focused on either secular “miracle cures” or religious “faith journeys.” Both types left me feeling physically broken and spiritually disconnected because the so-called miracles didn’t cure anything and the devotionals only highlighted my latent fear that I was an unfaithful daughter of God whom He found lacking. I wrote Barren among the Fruitful primarily for women in their childbearing years, understanding that most of those readers are as I was, emotionally vulnerable and in need of strength and love. The book strives to surround the reader with a sense of community while providing honest facts. It does not promise that medicine will give her a child or that God will give her a child. It does lead her from confusion about infertility to understanding. From embarrassment over her perceived failure to openness. And most importantly, from the now-broken faith she has in herself to a perfect faith in God’s plan for her future. But Barren is also for those who interact with infertility patients and that’s everyone. Infertility is on the rise and many doctors are anecdotally suggesting it will reach epidemic levels (over 40%) among young women in the next ten years. I like to think I’ve created a survey of the topic that quickly educates readers about the physical, financial, psychological, and spiritual struggles that accompany fertility treatment. Each chapter is titled with an off-the-cuff, sometimes hurtful, and often ridiculous comment I heard during my fertility journey, so readers can learn what to say (and what not to say!) to their hurting friends. It also includes the unique stories of multiple women, providing readers with a renewed hope for God’s plan for their future—with or without children. When the words aren’t flowing—or when you want to celebrate if they are—what is your favorite comfort food and why? I try to be really conscious of the foods I put in my mouth and body. I avoid all things artificial and super-processed, including the syrups cafes put in their flavored lattes. I typically take my coffee black. But Starbucks had a new item on their menus this past holiday season that has given me a crisis of conscience. The Chestnut Praline Latte (with an extra shot of espresso, thank you very much) is perfection. At the end of January, I’m still approaching the drive-thru speaker once a week and timidly asking, “Do you have the chestnut-praline syrup?” Bad, Amanda. Bad! If you knew you couldn’t fail, what dream would you pursue? While I was in grad school, my cell phone ringtone was the theme from Raiders of the Lost Ark. Yes, it’s a cliche, but every archaeologist wants to be Indiana Jones. I’m no different. My graduate degree is concentrated in biblical archaeology, and few times in my life have I been as happy as I was when sitting in a huge hole in Israel dusting dust off of dust. I would love to make archaeology my career, spending three months of the summer in the field and the rest of the year in a museum analyzing my finds. Real archaeologists never have Indiana Jones moments. We get over-the-moon excited when we find bichrome pottery in what we thought was a monochrome stratus, but we all dream of one day snatching our rimmed hats away from the traps of dangerous Nazi ark hunters! What Bible passage or story best describes your journey of faith? 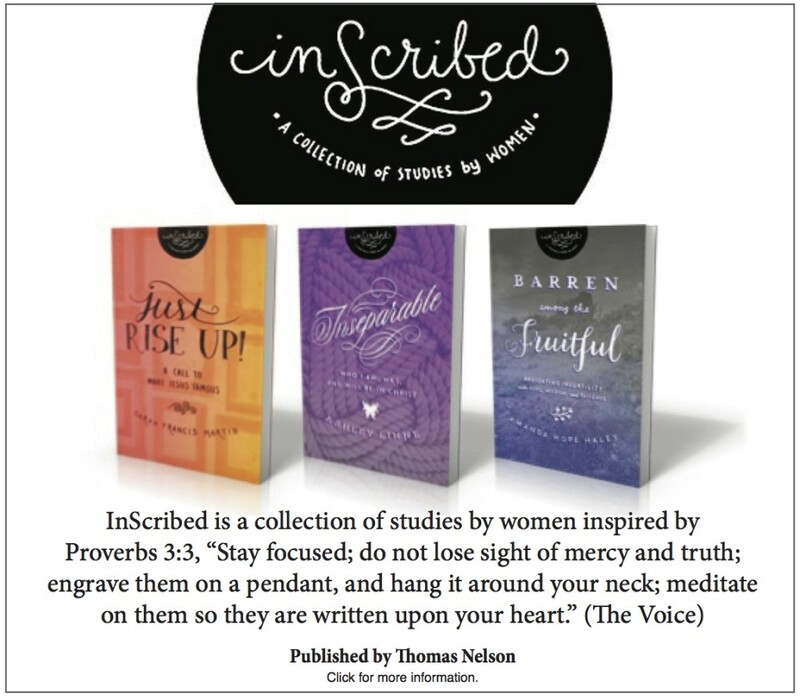 The most inspiring woman in the Bible, to me, is granted three verses of Scripture. Anna was the wife of a temple priest and she did not have children. She went to the temple courtyard every day and she prayed. Because of her faithfulness, God promised she’d see the Christ child before she died. At eighty-six, Anna was doing her habitual morning prayer when Mary and Joseph walked in with eight-day-old Jesus. Anna’s story is in the gospel because she identified Jesus as the Messiah. The fact that she was childless is ancillary. I wish I knew more about her. I wish I knew how she survived month after month of disappointment. I wonder if she was ever pregnant. Did she have a miscarriage? Did she have a baby and then lose him or her to illness? Anna teaches us something very important. Her three verses of scripture prove that a child is not a reward for a woman’s faithfulness to God. Meeting God face-to-face is the reward. I’m a dog lover. Please tell us about your pets, if any, or your favorite pet as a child. When I was six years old, Daddy let me pick out a puppy from a litter of thirteen Basset Hounds. We named her Sofi, and she was all Basset: stubborn, silly, and not-all-that brilliant. She died when I was in college and I cried an entire day. Since then, I’ve always wanted another dog but my husband of twelve years resisted . . . until about two months ago. We will be picking up our first puppy on January 31st. He’s a Basset Hound, too, and we’ll call him Copper. Based on the short videos the breeder has been sending each week, we’re bringing home a lazy guy who loves to chew chew chew! . . . on those rare occassions when he’s awake. Thanks, Amanda! It’s great having you as a guest at DivineDetour. For more information about Amanda, visit her website.